Saw that Tom's Palette had their tiramisu ice cream(only once a month) so decided to fill our tummies with sum food 1st b4 gorging on some sweet ice cream(i already aimed 3 flavours). I had a craving for kebabs so we thought we would try out Sofra. I hadnt patronised this place in years so i thought why not. Chefs plate A combination of Doner kebab, Izgara Kofte and a skewer of shish kebab. This is a run down of the different Kebabs. Doner kebab is like those kebabs u get at the pasar malam. the one the have on te huge rotissery thingy and then cut. We had both chicken and beef. I loved the chicken we got. It was juicy and was grilled just nice. Found the beef just normal but both were adequately spiced. Izgara Kofte is grilled minced patties. Now this i really liked. We got both chicken n lamb and i loved the lamb. Slightly on the spicy side and not too dry. Shish kebab is a skewer of chicken meat grilled with capsicum. It was a bit dry to me. Didnt really like it but it had a slightly tangy taste. The bread was good. soft on the inside and crispy on the outside. 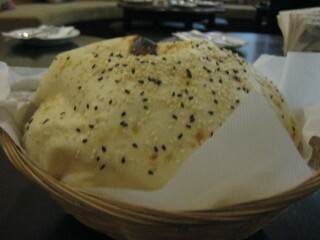 We also ordered a sesame bread - $3.50 which i loved!! !it came out looking like a balloon and it was hot...crispy yet soft and thin. Really really really good. At the end of the meal we were actually full. Decor wise. its quite nice, relaxing and there are 2 choices, the sofa like seats wic we sat on(but table a bit too low) but its good for chilling after the meal and of course the normal wood tables. Service was attentive and well mostly foreign staff but all were polite, and courteous. Would definitely return to try out the other items in the menu. Haven't been to Sofra for ages and so decided to bring a group of friends to try something "different" from what they use to savor. As usual for starters we ordered the Hummus ($4.20) and the Sesame Bread ($3.40). The Bread was soft, yet crispy so that made it interesting. Together with the Hummus, which was tinged with lemon juice, it was a great start to our meal. Izqara Kofte ($12.90) was served next. We ordered the mixed combination of chicken, lamb and beef. One of the more interesting dishes was the rice (Turkish Pilaf) . It was fluffy and very fragrant. Perhaps it was cooked in butter as they usually do with pilaf. We found out that the secret is in the sizzle – which gives it a creamy, buttery, and melt in the mouth consistency and taste. It’s the gastronomic equivalent of sinking into a huge armchair in front of a roaring log fire. But there was no log fire in Sofra. The meat varieties were well seasoned and it was refreshing for us as we were all hungry. Sultan Kebab ($12.50) arrived piping hot in an oven baked tray. The lamb pieces were tender and complimented the mashed potatoes with baked creamy cheese that just kept oozing out in between the layers. It was not at all difficult to eat as the meat was in bite sizes. 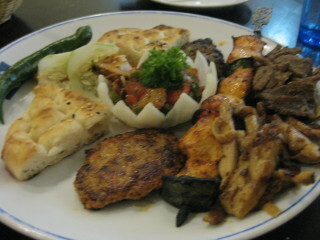 The final dish was the Jumbo Kebap Combo ($34.90) just right for 2 persons. It has the eggplant Kebap, shish Kebap and doner Kabap. 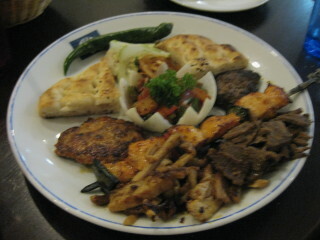 As usual, Sofra did not disappoint with their meat dishes which were done to the right taste and texture. i celebrate mother's day @ sofra...it was my first time dining there n it was simply superb.the food is good,the service is good,the atmosphere is cozy n relax,the waiter is polite n most important the price is reasonable..we had sofra salad,sofra kebab,sultan kebab,yapruk tavuk,chef plate,sofra fish,hazelnut espresso,turkish coffee,peach juice n orange juice...i spent abt $122 for 4 person.it was great.